Sources are very similar to effects. The difference is that, while effects change existing audio or video, Sources generate new content on the fly. Because they generate content, Sources need to be loaded the same way as you would load an audio or video content file. To use a source, drag it from the Sources panel on the right of the screen, to one of the clip slots. Let's drag the Rings Generator to an empty clip slot. Once placed, the properties for the Source will be available in the Clip tab. All Sources have a few shared properties. Like Stills, Sources have a Duration. This can be set in seconds or beats, depending on the Playback mode. This can be used to include the Source in an Autopilot sequence. 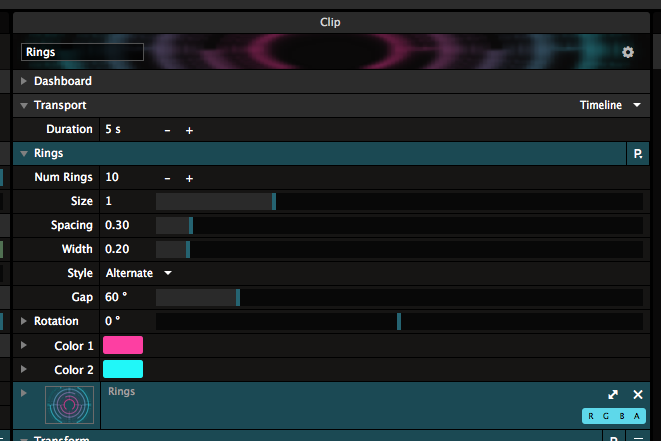 Sources also have the regular options to Scale, Position and Blend the clip like any other Video or Still file. Every Source has a few properties unique for that Source. For instance, Rings has a few obvious ones, like the number of rings, the overall size and the width of the rings. It also has a few less obvious ones like Gap and Style. The Line Scape Source will have completely different parameters again. The best way to get your head around these is to just play around with them and see what you like. When you find a specific look that you like for a Source, you can save that as a Preset using the P dropdown in the top right of the Properties. The Text Animator is a very powerful Source. As the name would suggest, it lets you generate and animate text on the fly. It has quite a few parameters, luckily most of them speak for themselves. Text, Font, Style, Color and Size can all be used to change the look of the text, and of course the text itself. Alignment and Position X and Y control how the text is distributed over the screen, and how multiple lines are aligned to each other. Spacing X and Y control the Tracking and Leading of the text respectively. Those are fancy typographist words for how far apart the letters are horizontally and vertically. We like simple words. 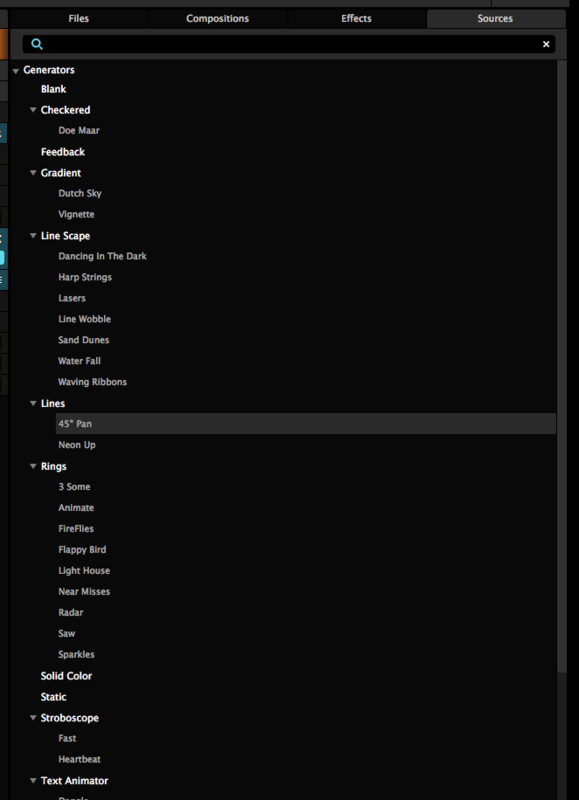 The fun with text really starts when toggle on Animate and twirl down its extra options. This opens up a world of possibilities for per character animation. Every parameter you change here will affect every character, based on certain amount of delay. Just grab the Scale param and give it a bit of a wiggle. Awesome right? 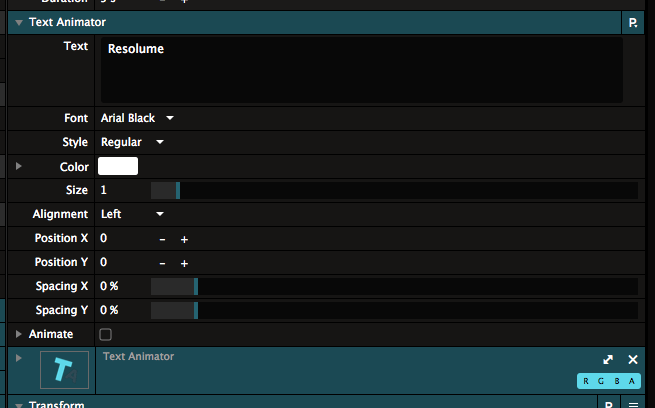 It gets even better when you realise that you can also animate these parameters, resulting in animated animation. Using the Delay parameter, you can change how long it takes for every character to respond to the changes. The Order lets the delay move from Front to Back or Back to Front through the characters, or let it affect characters randomly. Finally, by changing the Range, you can let the animation affect every character, every word, every line or just the whole text. The Video Router allows you take the output of a single layer or the layers below the router into another layer. On Arena, groups can also be used as input. This can be useful for complex projection mapping setups or to simply display the same clip simultaneously with different effects. The preview window output can be selected as an input as well. The toggles for Input Bypass/Solo and Input Opacity are only functional when a specific layer or group is selected as input. They serve as a pre-fader / post fader switch. For instance, when Input Opacity is disabled, the router will continue to show the input layer, even when the input layer's opacity is faded down. This is useful to avoid rendering another pass of a layer on top of itself. Capture devices are used to take input from other hardware into Resolume. For instance, your laptop's webcam will show up as a capture device. You can read all about capture devices on the Live Inputs page. These are essentially virtual video patch cables. They're so awesome that they got their very own page in the manual.